Did you know that for every inch forward your head is off center with forward head posture, it puts an extra 10-12 pounds of pressure on your cervical spine? That’s like carrying a bowling ball and your head on your neck! It’s easy to default to that forward head position when using technology like cell phones or tablets. Actions like texting can cause one’s shoulders to be hunched and create excessive stress and strain on the spine. Given the penchant most people have for technology, it’s no wonder that “text neck” has become a worldwide epidemic. Put it in neutral. Keep your body in as neutral a position as possible. Though we do think it’s always a good idea to take a break from our gadgets, you can set a reminder on your Fitbit or smart phone to maintain a neutral posture. Enlarge the font size. Make the text on your phone or tablet big enough to read easily to avoid hunching over. Consider putting your phone on an easel. If you let something else, like a stand or easel, hold your phone, doing so can help you avoid a hunched over position. While walking or sitting with good posture not only helps you to look more confident, maintaining that posture also can help you have a healthier spine. Most people don’t understand posture as it relates to health. We have curves in our spine for a reason — to displace weight against gravity. When those curves aren’t in the right place or excessive weight is put on them health problems can arise. 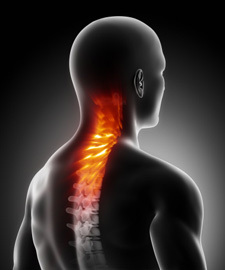 If the integrity of the spine is affected, conditions such as early arthritis or degenerative disc disease can result. Every time you catch yourself sitting slumped like a Slinky, sit tall from your core. Your head will naturally relax, and your shoulders will come down. It’s also a good idea to incorporate shoulder rolls or neck stretches into your daily routine. Note that you may not experience pain right away if your posture is poor. That’s why regular chiropractic adjustments and posture checks can help to keep your spine healthy for life!